It has become a grizzly routine for me to browse social media and come across pictures of dead Syrian children on my newsfeed. Over the past seven years, from the safety of Edinburgh, I’ve seen severed limbs, charred remains, melting skin and, most recently, the lifeless body of a Syrian child who had been decapitated by a Russian airstrike. Across all of Europe and around the globe, Russia is launching increasingly bold attackson the already fractured liberal democratic order. This is not hyperbole. This is not ‘Russophobia’. It was the first country since Nazi Germany to annex part of another European country, when it reacted to the peaceful overthrow of Ukraine’s pro-Russia puppet president by annexing Crimea, and waging a proxy war against the rest of the country. This ought to make the heavens darken, so to speak. It ought to arouse so much outrage among us – the privileged – that we fill up the streets and demand this daily murder end. But it will be met with silence and, most chillingly, indifference. For the violence in Syria, outside of small bursts of international attention usually sparked by chemical weapons atrocities, exists outside the consciousness of most of the world. Come this Thursday, the genocide in Syria, driven so decisively by Iran and Russia on behalf of Assad’s rump state, will not simply fall further down the rungs of the collective global attention span, but it will be actively normalised. Putin’s Russia is hosting the FIFA World Cup, which will draw around 4 billion global viewers. If you thought the silence or indifference or active support that surrounds the Syrian genocide and Russia’s role in it was bad enough, just wait until you get a load of the Russian state’s propaganda assault for the next month. Robbie Williams, the lead performer at the opening ceremony, has said it will be ‘an unforgettable show’, while gushing about how much he loves Russia. The most obvious point of comparison of the World Cup being held in Putin’s Russia, is Nazi Germany’s 1936 Berlin Olympics. The Third Reich had Richard Strauss, while Putin’s Russia has ‘a fat dancer from Take That’, or so went the infamous putdown of Williams by Oasis’ Liam Gallagher. In this sense, one might be tempted to conjure Marx’s famous statement about historic events repeating first as tragedy and then as farce, but there is nothing farcical about the effectiveness of a propaganda coup like hosting the FIFA World Cup, regarding Russia’s fascistic global ambitions. 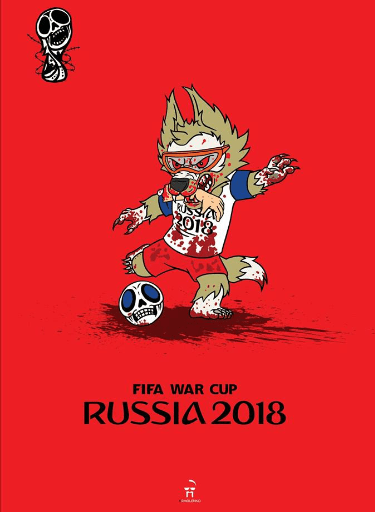 The silence surrounding Russia’s genocidal intervention in Syria was always a sign that Russian imperialism was winning, but Russia’s World Cup will lead to a new level of normalisation for its brutally sinister geopolitical agenda. Imagine the outrage of particularly the global Left, if this was any country other than Russia. Imagine if the US had held the World Cup during the Iraq war. There would be rightful outrage – campaigns and protests. In fact, think of the rightful indignation when it was announced that Eurovision would be held in Jerusalem, given Israel’s illegal occupation and annexation – or the logic of boycotting nations committing active human rights abuses in general. Yes, there exists a host of international sanctions that literally have zero effect in terms of shifting Putin’s policy, but what about organic solidarity or opposition to Russia’s genocidal, revanchist imperialist machinations? The tragic reality is that Russian fascism navigates itself essentially unhindered through an ocean of blood in Syria, while it casts its menacing shadow over European capitals with little to no popular resistance. In the UK, the reaction to Russia’s chemical weapons attack in Salisbury, the first attack by a foreign country on English soil since the Blitz, targeting a Russian defector, was muted to say the least. Conspiracy theories pumped out by formal and informal Russian propagandists, including one tacitly endorsed by leader of the UK opposition, Jeremy Corbyn, has diluted and obscured the discourse. In fact, there exists, as has been covered extensively, a very deliberately cultivated distortion, woven through pro-Russia propaganda outlets, where Russia is cast as a victim of western aggression and a bastion of truth against western lies. The news of Russian links to funding the Leave campaign are buried away in the minutes of select committees and articles that most people won’t read. Similarly, the Sunday Times finding that 6,000 Russian twitter accounts had been mysteriously mobilised to support Corbyn’s Labour at the last UK general election, has scarcely penetrated public consciousness. Russia has, over the past few decades, not just begun to reassert itself after the humiliating collapse of the Soviet empire, but it is now actively attempting to shape world order in its own image. This is an order of authoritarianism and anti-egalitarianism, being sealed by the genocide in Syria. It’s in the killing fields of Syria, the devastated urban landscapes of East Ghouta, Aleppo and Homs – annihilated by Russian missiles, artillery shells, white phosphorus munitions and cluster bombs – that Russia is hammering out its new world order. And it is winning on multiple different fronts. Russia is successfully degrading the mode of ethics that allegedly conditions world order. It is seeking to turn the world into an abode of monsters, of authoritarian tyrants, of which it is something of a vanguard. Moreover, Russia’s authoritarian order manages to unite left and right-wing forces in support of its endeavours. Though the comparison between Russia and the rise of European fascism of the 20th century is apt, in reality, there is much less resistance to Russia’s authoritarian drive than there was to historic fascism. The same social forces that opposed fascism in the 20th century seem likely to support the narratives of Russian imperialism, namely that it provides opposition to US imperialism and the western ‘neoliberal’ economic order. The Left see liberal democracy as ‘bourgeois democracy’ and thus see any chance of weakening it as a good thing, while Russia’s propaganda outlets provide them with numerous platforms. To the Right, Russia is a bastion of white Christian civilisation against ‘Islamification’ and liberalism; it serves to unravel the egalitarian gains and order of liberal democracy, long hated by the Right. Russia’s hosting of the World Cup can only be seen through this context. In fact, to those of us who oppose authoritarianism, racism, imperialism, homophobia and, most urgently, genocide, it must be seen this way. The fact that this is by and large not the case, is symptomatic of the fact that fascism with a Russian face is triumphing, and there is no coherent resistance to its advance. The US, its allegedly ‘natural’ counterbalance, is controlled by a president who is potentially in thrall to Putin, while he continues to help Russia’s anti-EU crusade by weakening his alleged European allies and forcing them to rely more on Putin’s Russia. In addition to the political rise of pro-Russia forces, Europe itself has largely gone down the road of counterintuitive appeasement, terrified of escalation that is occurring regardless – the Salisbury attack was a result of Russia’s triumph. It knows that its enemies are capable of nothing, it has balked at their limp response by so-called democrats to its imperialist assault on Ukraine. It has seen that the world is willing to accommodate and green light genocide rather than risk even a remote confrontation with it, despite its bluff having been successfully called in localised circumstances. There is unlikely to be any opposition from the compliant or terrified Russian populace. Internal dissent will be and has been crushed. We’ve already seen Mo Salah, a hero to millions, pose with Ramzan Kadyrov, the kleptocratic tyrannical head of the Chechen Republic, under whose watch brutal anti-gay purges have taken place. This is a glimpse of the process of normalisation. If these basic progressive values can’t be defended, what chance do Syrians have? Where any criticism exists, from human rights groups and Russia’s victims, it will fall on deaf ears as the world is mesmerised by the tournament. As Russia continues to murder Syrian children, snuffing out the precious seeds of life and hope in a faraway land, as Russia continues to brazenly erode democracy, the world will have their games, and Putin will have his Olympia.